A few years ago several of my three-year-old students asked me a question, and I responded, “How could we find the answer to your question?” They stared at me and said, “We’re asking you because you’re a teacher, and teachers know everything!” While flattering, I had to tell them that I most certainly do not know everything. Instead, there are many other ways in which we can seek the answers to our questions. This moment illustrates the importance of directly teaching children the skills, even as young children, to find the answers to their wonders. At SEEC, we define inquiry as asking questions, but also as the process to find the answers. In order to ask effective questions and have the tools to seek answers, children must be curious, know how to observe, describe, make connections, and communicate. From infants to kindergarten, our classes foster these skills to ensure our children leave our school with a love of learning, a ferocious curiosity and the ability to find the answers to their questions. Recently, one of our four-year-old classes, led by Will Kuehnle and Jessie Miller, spent some time discussing what it means to be curious, and what tools could help them explore their curiosities. To begin their experience they went to the National Gallery of Art to see The Thinker (Le Penseur) by Auguste Rodin. They looked at the sculpture and pondered how its body language depicted thinking. They even tried to pose themselves. Next, they discussed four tools to use when we have a question: asking an expert, observing, reading a book, and/or going to a museum. After discussing these inquiry tools in the gallery, the class headed outside to the National Mall to make these ideas more concrete through play. The children got into groups and went through stations, each representing one of the inquiry tools they previously identified. At the “Ask the Expert” station, the children dressed up and pretended to be experts on different topics. One child would ask a question while the other child listened. The conversation would continue back and forth while one child spoke and the other waited and responded. The teacher could step in and model this for the children as well as praise them when waited for their turn to speak. This was a great opportunity for the children to practice patience and listening. The “Read a Book” station contained several books where children could flip through and gain knowledge through their reading. Lastly, the “Go to a Museum” station had blocks for the children to build a museum where they might be able to answer their wonders. Back at school that afternoon, the class had an opportunity to play at the stations again if they wished. Recently, during storytime a child asked a question about something in the book. The other children were quick to suggest finding a book on the subject or visiting a museum to find out more information. The teachers have also observed students using language such as “curious” and “inquire” more often in their day-to-day conversations. By spending time practicing listening, vocalizing questions, and exploring how to find answers, the students have built a strong foundation that will serve them as they progress in school and life. Join us on January 17th to learn more about Fostering Wonder with young children. Picky eater? Feel like you’ve tried it all? We get it! Here a few things that have helped us at SEEC make meal times go a little smoother. Try a themed meal. Everyone comes dressed in a costume, a fancy (washable) outfit, or even pajamas. This will make dinner feel like a fun family event instead of the ultimate stand-off. Your child will look forward to showing off their special duds at the table and shift their focus away from the normal ultimate stand-off they are prepared for and maybe even try the meal. Getting your child to the table can often be half the battle. At SEEC, we all eat together as a group. Once everyone is seated we sing a song to signify it is time to eat. It has become a favorite event for the children at SEEC and there are often tears if a child doesn’t get to participate in this part of the day. At this point, almost everyone has used the “try-it-bite” with their child. However, it shouldn’t only be required of the kids, adults at the table should model the same behavior by putting a “try-it-bite” of something on their own plate. Then organize a unified “try-it” moment during the dinner. We all have our preferences so if a child has tried something before and claimed they don’t like it, it is possible that it’s true. Taste buds change over time but forcing them to try an item again shortly after they have declared their preference can feel like you are not listening and respecting their words. An important milestone is when a child can pour without spilling and feed themselves with utensils. Why not give them a chance to practice at dinner? Instead of plating their food, allow your child to dish up their own meal. This way they can decide how much to put on their plate. When a child declares they are done, but there is food still left on their plate, remind them that they chose to put that amount on their plate and should try to finish what they have taken. No one, not even adults, like to be ripped away from their current activity or to go straight to a seated meal before having a little time to transition. Be sure there is time for your child to decompress between preschool, daycare, or whatever previous activity they were a part of. Provide them with warnings so that they can begin to prepare for the transition to dinner. At SEEC we give children a five-minute warning and ask them to repeat it back to us. They might not tell time or understand exactly how long five minutes is, but they understand that soon they will stop with one activity and move to the next. If your child needs a more concrete way to understand the passing of time try a sand timer. You can get them in a variety of time lengths and it’s a great visual representation of the passing of time. Having especially difficult meal times or having trouble getting your child to eat anything at all? Try a sticker chart. Sit down with your child and ask them to reflect on how they thought the meal went. Provide a smiley or similar sticker and if you both agree the meal went well (you can decide what this means since it will be different for every family) they get to add the sticker to the chart. You can even provide a small reward for a week full of successful meals (this could be something as easy as an extra book bed at bedtime!). The way a child responds to food could not only be based on taste but on texture and shape. If you are getting the “it looks weird” face try mashing or pureeing the item so that it takes on a form similar to something they do like. Even as adults we respond to how something looks or feels as we eat. When someone says you have to do something, most of our initial reactions are to dig in or push back. Children are the same. If you take the pressure off the meal and keep things light, the meal will be much more enjoyable for everyone. Children have a wonderful ability to read a mood and then reflect it back. Just remember, if you are frustrated they will be too. Make eating into a game. Does your child have a favorite animal? Are they really into trucks? Why not ask them to take small mouse bites to try a new food or pretend they are a backhoe shoveling up a big bite! Try mixing up the eating implement as it will make eating more fun. Try chopsticks or even a spork. The novel aspect of the eating tool will make it exciting for your child to use it to eat. It also has the added benefit of providing your child with additional fine motor practice! Have other tricks that work for your family? Please share! Though our school is not strictly play-based, it recognizes the importance of play and incorporates it into our unique brand of object-based learning. Much like other early childhood schools, you will observe our children engaging in play during classroom choices and playground time. You can also find our children playing in the museums, but not just in the play-based spaces. 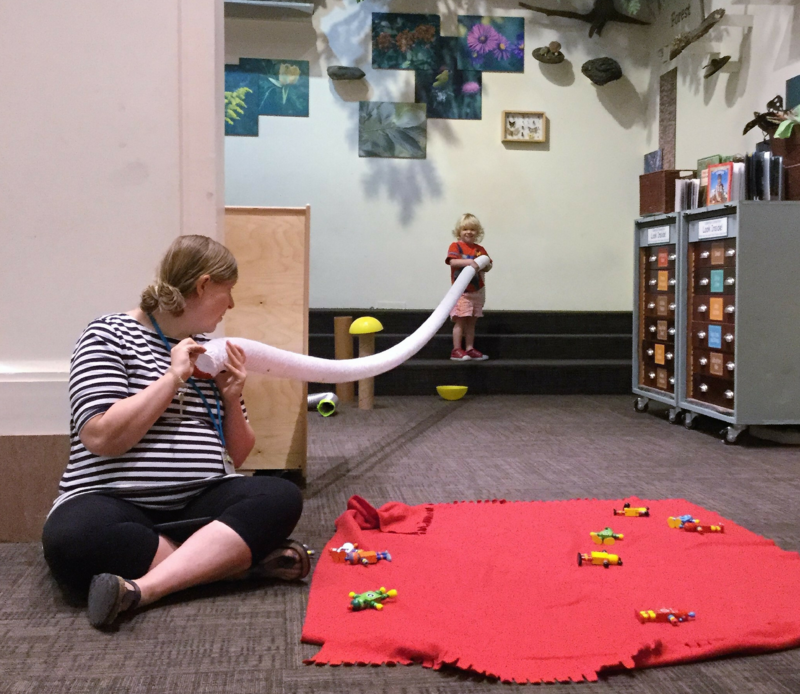 We think creatively about how to safely incorporate play into our museum or community visits. Over the years, we have heard from educators that often caregivers don’t appreciate or understand the value of play. I won’t lie, I too, was at one point one of those parents. 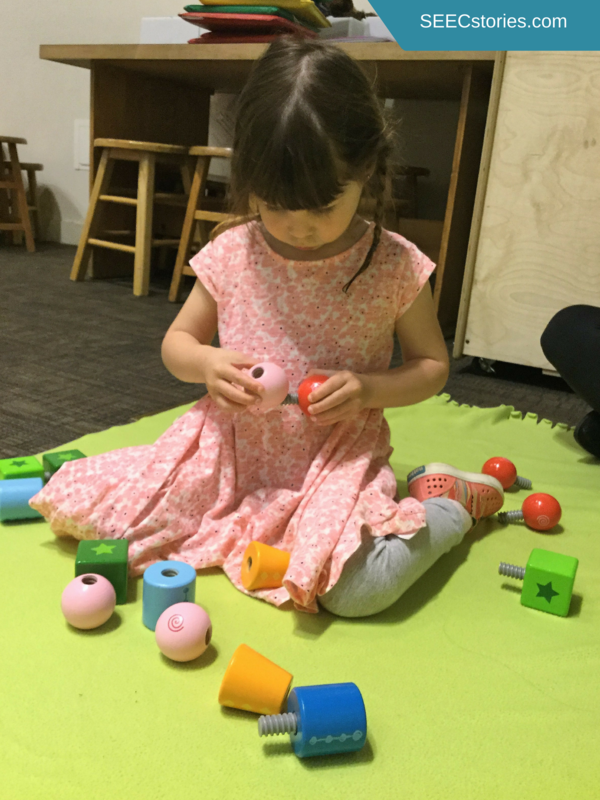 Before beginning my career in early childhood education, I enrolled my daughter in a play-based cooperative preschool and one of my biggest concerns was if they would incorporate letter/number recognition into the curriculum. That was more than ten years ago and my outlook has drastically changed. I have also observed sentiments similar in parents today. I recall a specific conversation with a parent whose child had recently transitioned from a play group to a SEEC program. 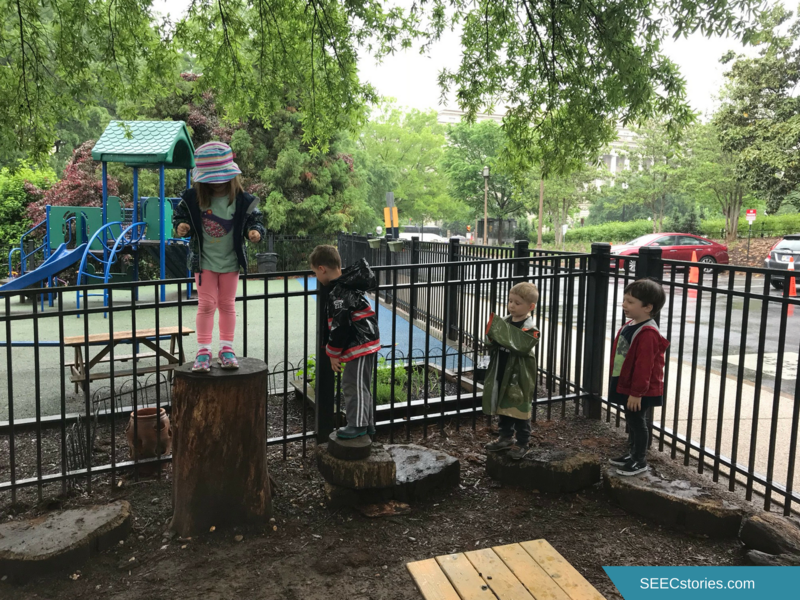 The parent was happy about the transition because she felt like all the kids did “was play.” Through discussions with other educators, in and outside of SEEC, I have found that other parents share a similar concern about the role of play in the classroom. I don’t mean to suggest that all caregivers feel that play is not important or even that they don’t see ANY value in the act of playing. In fact, there was recently a heated discussion at the school one of my children attends regarding recess. Some of the students had been missing recess due to make up work or for disciplinary reasons and that did not sit well with our parent community. I think it is important to note that there is a range of parent perspectives on play. At the same time that we have been reflecting on how parents feel about play, our team has also been focusing in how we can support our parent community and the community at large. It occurred to us that our upcoming workshop, Play: Engaging Learners in Object Rich Environments would be an ideal venue to explore parent attitudes towards play and strategize ways we can engage parents in a dialogue about the value of it. It’s a waste of money to pay for someone to watch their kids just play. Play doesn’t look like traditional learning. Play doesn’t look like hard work, so it’s not important. Playing won’t teach them how to hold a pencil, read, or write. Playing won’t give them the skills to be successful in life. Over the next few weeks, we will be collecting more feedback from parents and look forward to sharing their perspectives at our upcoming seminar in July. We are excited to think together about this as a group and look forward to sharing more broadly in future postings. In a recent article Smithsonian Secretary Skorton posited that museums can help people regain trust in “traditional democratic institutions”. His argument centered around a study indicating that many Americans have lost faith in the institutions that are the foundation of our democratic system. He spoke to the fact that not just Americans, but citizens across the globe seem to be losing trust in their own societies and pondered how a democracy can function without the trust of its citizens. Secretary Skorton sees museums and libraries, not only as institutions that provide reliable and objective information, but also as places where questions can be posed, dialogues can be had, and a variety of perspectives can be explored. As leader of the Smithsonian, moreover, he sees museums as places where communities can come together to better understand themselves and the world around them. I have seen how our museums and centres engage visitors and transform the way they see the world—especially our youngest visitors, who light up with the joy of new discovery. Through our education programs, we reach millions of national and international students, often using objects from our collections to demonstrate experiences and viewpoints that differ from what they might have encountered. By revealing history through the lens of diverse perspectives, museums humanize other cultures and contextualize present-day events and people. The Secretary’s comments made me think more about the role museums can play in supporting a young child’s civic education. When I look specifically at SEEC, I see our school and programs as supporting a child’s understanding of democracy via museums in three ways. One of those ways, is asking them to understand the importance of objects from other cultures or historical periods. Many don’t see young children as capable of this type of perspective-taking, but with the right approach, young children can develop this type of understanding and empathy. One of the ways SEEC educators manage this is by taking what is familiar to children and applying it to the unfamiliar. Consider the collection of footwear on display at the Smithsonian Castle from the National Museum of the American Indian. The shoes, at first glance, may feel strange to a young child living in contemporary American society, but an educator can encourage a child to think beyond their own experiences by beginning with what they do know. A faculty member might inquire: “Why do we wear shoes? When do we wear certain types of shoes?, How do shoes help us?.” By applying these answers to the American Indian collection, children begin to see the many things we, humans, have in common. At the same time, a child are also able to acknowledge and celebrate the differences they observe. This type of lesson, especially if repeated, makes a lasting impression. We might be different, but those differences can be celebrated. It also underlines how we are part of one human family who shares many commonalities. Secondly, young children who consistently spend time in museums can begin to understand and appreciate the role museums can play in learning, exploring, and questioning. During a recent conversation with a SEEC educator, he shared with me that in his Pre-K classroom children are routinely encouraged to ask questions and look for answers. He tell his class, that he, himself, doesn’t always have the answers and encourages them to seek answers via trusted resources. The children in this classroom have created a shortlist of “go to” places where they can get trusted answers. Of course, at the the top of this list is the museum. For our SEEC students who have spent much of their young lives in these institutions, they understand how museums provide not simply information, but concrete manifestations of this knowledge. Consider the toddler who is learning about colors and visits the Hirshhorn Museum and Sculpture Garden. His knowledge is expanded by exploring the artworks and seeing the many different hues of blue. Similarly, consider the kindergartner who is learning about Rosa Parks and after viewing her portrait by Marshall D. Rumbaugh at the National Portrait Gallery. Through age-appropriate conversation, she can gain deeper insight into Parks’ role in the Montgomery Bus Boycott. Both children are learning that the museum is a place where they can turn to for both factual information and for viewpoints other than their own. Finally, the very nature of how we teach at SEEC (and I think you could say this is true for many museum and classroom educators) reaffirms trust in democratic discourse. SEEC lessons often begin with a question and are composed around a conversation. For example, we might pose a scientific question like, “Why do cars have wheels?” or something more abstract like, “How do you think the woman in the painting feels?.” By simply engaging young children in conversation we are helping them to develop socially and emotionally. By framing these conversations within a museum, we can also encourage children to see the institution as a place in which dialogue is part of the experience. Within that dialogue, educators can facilitate conversations that encourage children to listen to and respect the ideas of others – something which will hopefully cultivate a generation of leaders who can engage in conversations resulting in positive democratic change. As early childhood educators, whether in the classroom or the museum, we have a unique opportunity to frame the museum as a place where children can acquire knowledge throughout their life. Museum education is so much more than learning a new fact. It is a place where people of all ages can apply new information in a way that helps them value different perspectives and understand the ideas of others. While SEEC is uniquely situated to achieve this as a school on the Smithsonian campus, all schools and museums can support these democratic values. Classroom faculty can engage in conversations at their schools utilizing museum objects as a focal point via online resources. Museum educators can cultivate educational experiences that are friendly to all families and and frame developmentally appropriate experiences that support young children as capable learners. If we can support learning in this open-ended way, museums can and will remains stalwarts of democracy. Skorton, David J. “How Do We Restore Trust in Our Democracies?” Smithsonian.com, Smithsonian Institution, 12 Mar. 2018, http://www.smithsonianmag.com/smithsonian-institution/how-do-we-restore-trust-our-democracies-museums-can-be-starting-point-180968448/#FsSTi0ZDsl6qSVV0.99.